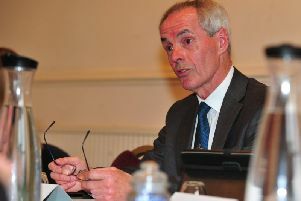 Ripon city councillor Stuart Martin has called for transparency on the future of Ripon community hospital's services. The Harrogate and Rural District CCG said there are “no current plans” to close Ripon’s minor injuries unit, but the Chair of North Yorkshire’s Scrutiny of Health Committee has called for clarity on the future of the hospital’s services. The Harrogate and District NHS Foundation Trust and the CCG confirmed the current status of the unit this week, but Coun Jim Clark said the facility must be closely monitored and protected, after fears were raised it could be under threat following closures of minor injuries units elsewhere in the country. He said: “I am happy to hear that there are no current plans for closure, but I do think there needs to be clarity on future services that will be provided from Ripon Community Hospital, because it is an important part of the provision of health service in Ripon and the district. “I don’t think there is anything imminent, as the CCG is in considerable financial difficulty. Their main problem has been not being able to go ahead with the mental health facility in Harrogate, but the facilities at Ripon hospital are something that we must keep an eye on. Ripon city councillor Stuart Martin, whose grandfather Wilf Parnaby fought to save Ripon hospital from closure in the 1960s, is urging the CCG to be transparent about the future of the hospital’s services. Coun Martin said: “What really concerns me is the future of Ripon hospital - not so much the building, but the services that the hospital provides. The minor injuries unit is vital for Ripon residents. The Chief Executive of the Harrogate and District NHS Foundation Trust, Ros Tolcher, said: “The opening hours of the minor injury unit at Ripon Community Hospital have been reduced in recent months. “The unit now closes at 7pm to ensure we can safely staff the unit. Providing high quality safe care is our number one priority. A statement from the Harrogate and Rural District CCG also confirmed there were no current plans to close the unit.